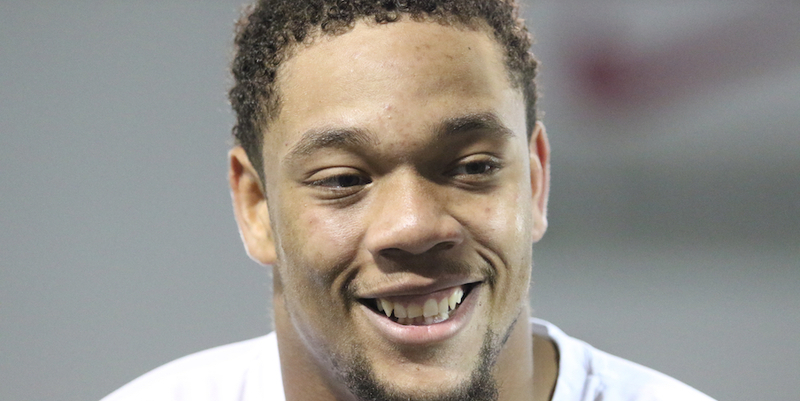 When Demetrius Knox stops smiling, something bad must have happened. Something really, really bad. So when he fell to the ground in pain in the final two minutes of Ohio State’s final regular season game of the season, a 62-39 win against Michigan, it wasn’t too difficult to see something was wrong. He knew. Everyone knew. That really, really bad thing had happened. “Everybody as an athlete, they get that feeling when something's not right,” Knox said early Sunday morning. Knox rode out of the stadium on the back of a cart with a grimace on his face. He raised his hands above his head in the form of an “O” and an “H” as applause and cheers rained down from the Ohio Stadium stands. Soon, Knox learned a Lisfranc injury in his foot cut short his senior day and likely ended collegiate career. But it wasn’t long until the gregarious right guard began smiling again. On Saturday, he had no reason not to be happy. Sure, he would have preferred to be out on the field finishing the season with his teammates, but he watched from the sidelines as the Buckeyes knocked off Northwestern with a 45-24 win to clinch the Big Ten championship. Most people in his situation would have been at home on their couch watching the game. Once he learned surgery would be necessary, Knox talked to the doctors. He had to let them know that he wasn’t willing to go under the knife if it required him missing the conference title game. The doctors told Knox his request wasn’t particularly normal. Most people accept surgery on the earliest possible date, if for no other reason than to deal with the pain that comes with rolling around on a scooter. That was a small sacrifice for Knox, though. Once the doctors let him know that delaying the surgery would not harm his career negatively in the future, and after he convinced them that he could deal with the pain, Knox was back to his affable, smiling self. He showed up to each practice leading up to the Big Ten title game to help redshirt freshman Wyatt Davis prepare for his first career start, which happened to come in a high-stakes moment. Knox mainly helped Davis – whom he called his “little brother” – with the “simple stuff” that players learn as they mature and gain experience. Twice during his career, circumstances forced Knox into immediate action, similarly to Davis. First, he played a few dozen snaps in the Fiesta Bowl loss to Clemson in emergency duty. Then, last year, he replaced Branden Bowen after the starting guard suffered a broken leg and started eight games. Against the Wolverines, Knox found himself on the other side of the injury replacement situation, though. Well, he actually could ask for a little bit more. And Saturday night, he got it. So, how’s Knox dealing with the pain? “Well, you know, I've got a nice ring on the way, so I think very well,” said Knox, of course, with a smile.